Retail $15.49 SAVE 30% ! "Decent Saw for the cost"
Small and decent quality saw for the cost of the item but does well. The mitre box definitely does the job for the job but could be more sturdy and beefy to be able to handle the load. The Mitre saw and Box can be very useful for making accurate cuts. In fact, that&apos;s exactly what they&apos;re made for. The slots in mitre boxes guide the cut all the way through to the object being cut. 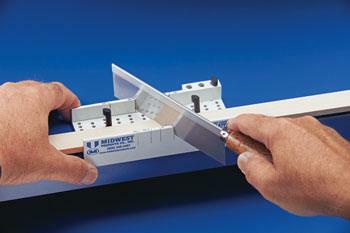 "great saw and mitre box"
This is a must for anyone wanting to make precision cuts in different types of materials. Nice feature is all the possible angles. Works great so far.